Controls Your Doors: Adjustable door strap will help keep any door manageable. Easy installation: Offers a simple and easy installation. 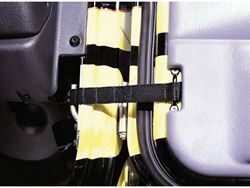 Rampage Products Adjustable Door Straps are designed for 1987 to 2006 TJ and YJ Jeep Wranglers and 1976 to 1985 CJ's. The adjustable door strap from Rampage is designed to help keep your doors from opening further than you want. It is very easy to install and the adjustment let you open the door to your desired maximum position. Door strap is constructed of a very durable nylon material to take years of use and abuse.